He's such a little fighter. No one knows exactly how many people looked right past this little life — until a dog finally found him and realized he needed saving. The dog was out for a walk with his owner in Ontario when he came across what looked like a pile of dirty snow. 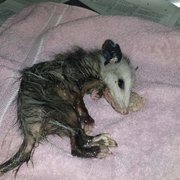 It turned out to be much more than that; a little opossum was just lying there on the ground — and the little animal desperately needed help. He was immobile and seemed to be in pain. He was also dangerously thin and covered in fleas. Indeed, it was remarkable he was still alive. 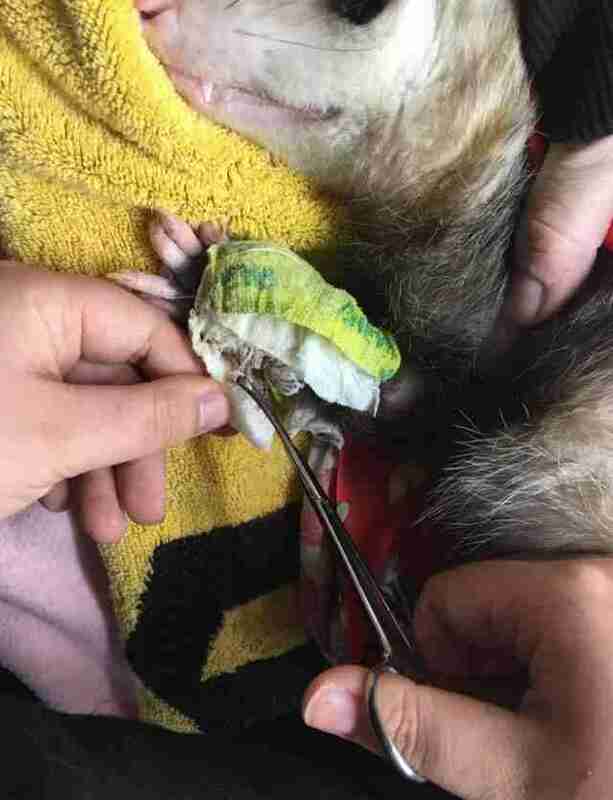 When the opossum arrived at a rescue center, Wildlife Haven Waterloo (WHW), Joy Huggins, the founder, was shocked at how determined to survive this little opossum was, given his condition. Underweight, weak, dehydrated and already missing his right paw (it looked as if he'd sustained a previous injury and had to have his leg amputated), there was something very wrong with his left paw. Rescuers named him Saber, to lend him the strength of a saber-toothed tiger (and because of his prominent teeth). 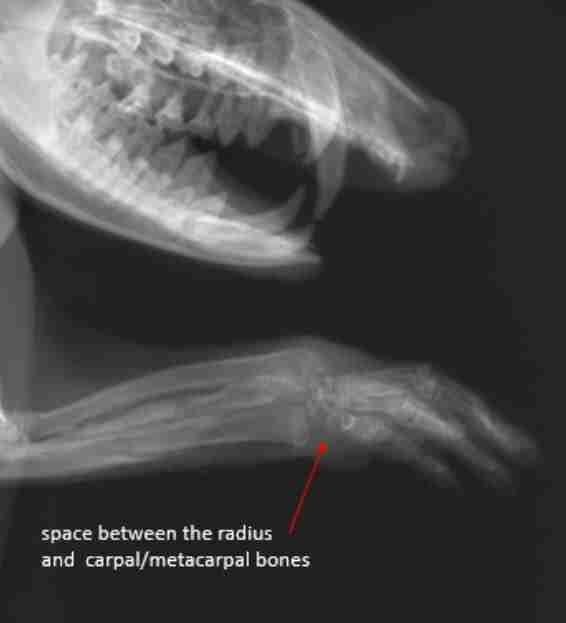 At the vet, X-rays revealed that, while there were no fractures, something had caused the bones of his paw and leg to separate and that's why Saber was having such a hard time moving around. "Put immediately on several antibiotics, pain medications and topical treatments for parasites, Saber’s legs were bandaged and a very specific treatment plan implemented," WHW wrote on Facebook on Sunday. "Over the course of the next week, Saber would be given intensive 'round-the-clock care [and] a temperature-regulated environment, alongside the daily injection of subcutaneous fluids and eventual tube-feeding of specialized formulas. This would allow his body to slowly regain strength and familiarity to hydration, food and medication." Huggins is determined to see Saber through this rough time. Now that he's gained some weight and gone through one course of medication, he'll revisit the vet to see what can be done about his leg. "I am wrapping it and putting this special gel on the wound to help promote healthy healing. Every three days it needs to be changed," Huggins said. "The swelling has gone down somewhat but the bone that was exposed looks worse to me ... Of course, if we amputate the left front leg, he won’t have any front legs. I don’t see that working. I am very worried! I am really fond of this little guy!" 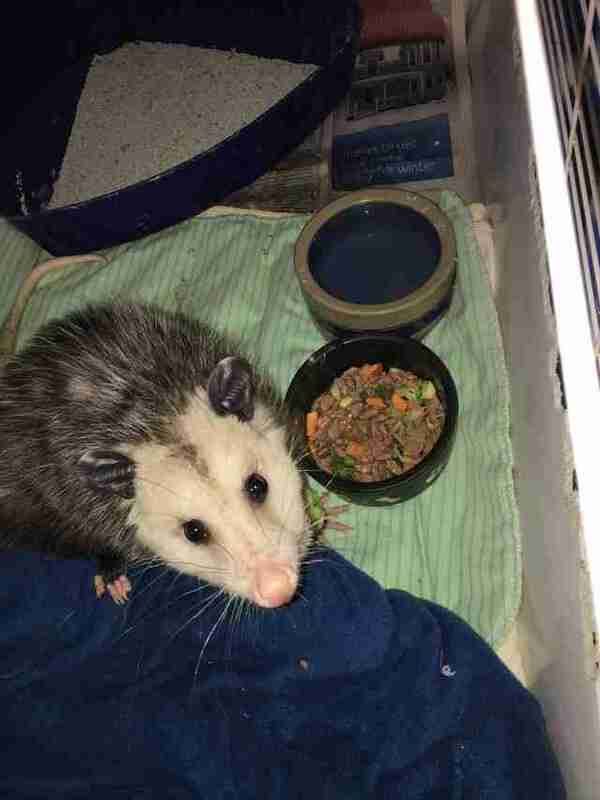 It's rare for people to take such concern over opossums, which are often thought to be pests. But these animals are actually quite remarkable. 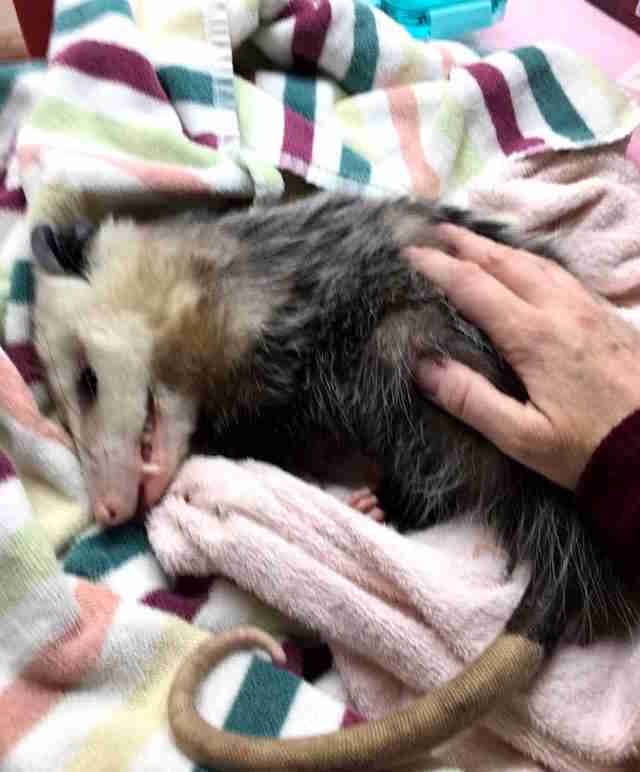 Not only are they North America's only native marsupial, mother opossums are quite devoted to their young, who ride around on her back once they're big enough to leave her pouch. 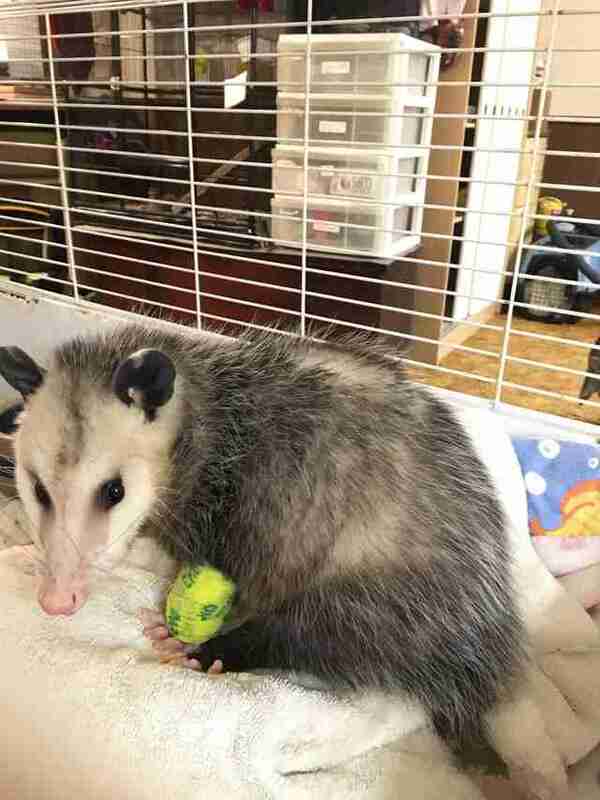 Saber is still a young opossum — and people are hopeful that he'll be able to live a full life, once his leg issue is sorted out. "Those first few days were definitely touch and go," WHW wrote, "but Joy’s heart swelled when on the third day our little Saber was offered a small amount of yogurt and mashed banana and ate it on his own!" Ten days after his arrival, Saber is even stronger. 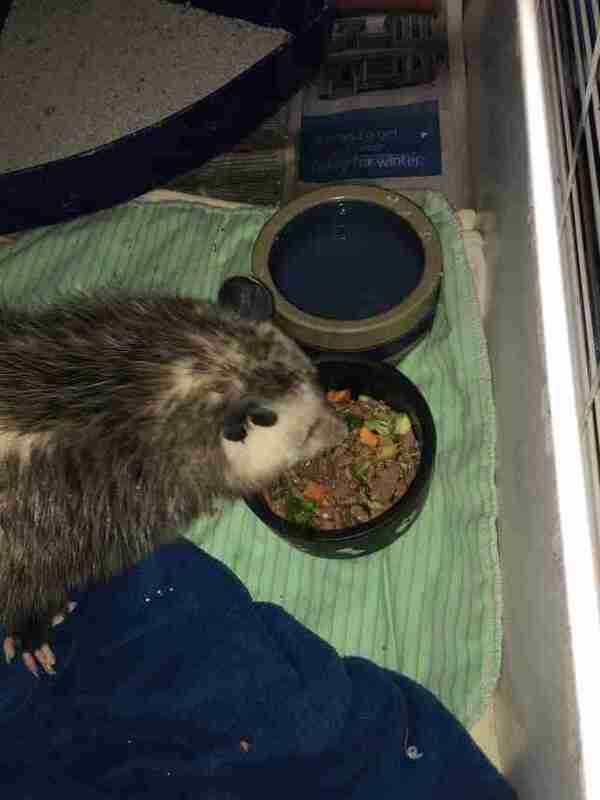 He's drinking and eating on his own, advancing to chicken and fresh veggies. He is even moving around on his own in his enclosure and using a litter box. "Although Saber’s prognosis continues to be guarded, we are hopeful that given time, that front left leg and bone will heal enough to allow full use and mobility," WHW wrote. To support WHW in helping more animals like Saber, you can make a donation to its life-saving work.